Larissa Czuchnowsky grew up in Windsor, Ontario, the daughter of Polish immigrants Dan and Mica Czuchnowsky. After high school, she took a gap year to travel to Mexico, Guatemala, and Honduras, and to volunteer on organic farms on the west coast of Canada. 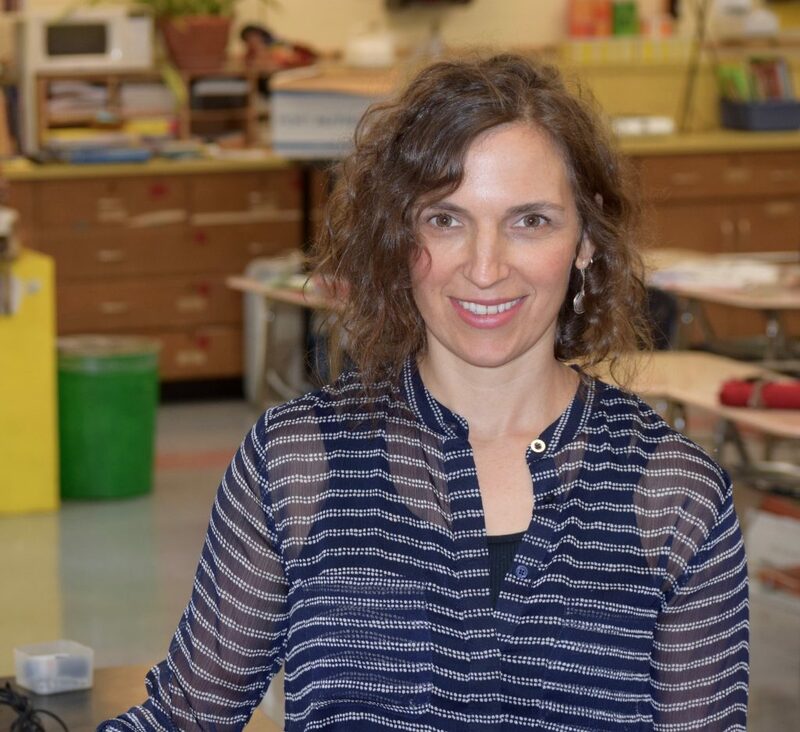 Czuchnowsky attended the University of Montreal, the University of Windsor and Eastern Michigan University, earning a bachelor’s degree in classical and modern languages, a bachelor’s of education, and a master’s of social foundations in education. She also studied in Oaxaca, Mexico on a Fullbright Scholarship and participated in various language and cultural programs in Germany, Quebec, and India. After teaching in the Willow Run school district for her first year, Czuchnowsky moved to Forsythe Middle School, where she has taught for the last 16 years. She and her husband Frank have two children: Isaac, a seventh grader at Forsythe, and Leila, who is almost four. The couple runs the Blue Turtle Nature Awareness and Wilderness Skills Camp on their property in the summertime. What do you most remember about being in middle school? Well, I went to a K-8 school so I remember being really ready for high school! I also remember being very interested in the world, poetry, photography, clothes and my friends. But it also coincided with some difficult times for my family, so it was plenty awkward and confusing as well. What was always written on your report card in grade school? I was always a good student in school and identified with being one. Teachers enjoyed having me in their classes. I was a positive leader. What inspired you to become a teacher? Why Spanish? At the age of 18, I remember thinking that I wanted to be a naturopathic doctor, a psychologist or a teacher. I went with being a teacher. During my gap year, I became enamored with Spanish and as I continued studying, I realized that teaching Spanish was what I wanted to do. Describe an average workday. I wake up at 6, meditate, stretch, think about my intentions for the day, then I drink some herbal tea and take my supplements. At 6:45 I wake up my children and husband. Frank makes breakfast and lunch for Isaac, I get Leila and myself dressed. We drive to Leila’s daycare and then Forsythe for me and Isaac. I teach my classes and then prep for the next day, have meetings, answer emails during lunch and at the end of the day, there is always something to work on: either more planning, creating new activities or grading. I usually need at least an hour after school and on Thursdays, I stay for two hours to do extra planning and prep for the next week. What advice would you give to a first-year teacher? Visit other teachers’ classrooms in your building during your prep to get classroom managemen—and other—ideas from fellow teachers. Hang in there. It gets better every year! How do you stay organized? I put things away every day, use a planner and make lists. What is unique about teaching at Forsythe? We have a great staff and great students. The staff is always brainstorming ways to do things better and we really like each other. What is the most rewarding part of teaching? Teaching is my passion. I love creating activities, mapping out a lesson and then facilitating that lesson and seeing the results and watching my students master new skills. I love the energy of my students and the relationships that we have together. It’s all very rewarding, satisfying and uplifting. It’s work that does a heart good! What has surprised you most about the profession? Teaching is a craft that one continues to grow in each year. Even after many years, there are always new areas to explore and improve upon. What do you wish everyone realized about the work of a teacher? Teaching is not a desk job. It is very physically, intellectually and emotionally demanding. Also, this is some of the most important work in society. Helping to raise and educate young citizens is crucial to a successful future for everyone. How do you recharge? I like to go for walks in the woods, garden, hang out with my family, go on bike rides with them, meditate and organize my house. What’s most exciting about your professional life right now? I’m most excited about focusing on proficiency based methods: using the language rather than learning about the language. There are so many exciting ideas being shared by my contemporaries all around the country. I’m also excited by the fact that my son is in seventh grade at Forsythe. I love that I get a small window into his school day. Larissa is an amazing teacher and mom. She uses every ounce of her day to be the big 3, Kind, Respectful and Charitable. She does indeed put a great deal into her language classes however she also puts much time and effort into making sure that Middle School is a place where children can feel confident, secure and happy; this way they retain more of what they learn but moreover they enjoy coming to school. She is to be cherished and as a parent of a Forsythe child I am thrilled that she is there, watching over and guiding our children. I deeply respect my colleague Larissa and I find her work and ideas that she shares with us about teaching Spanish very inspiring.